In hot pursuit of the Roadrunner, Wile E. Coyote runs straight over the edge of a precipice. He's so fixated on his forward goal that he fails to notice there is no longer any ground underneath his feet. Twenty metres out, he makes the fatal error of looking down and gravity takes care of the rest. In this essay, I want to suggest that something very loosely analogous happened to art in the first half of the last century. For the avant gardes, there was nothing underfoot after about 1915 – but it wasn't until the mid 1950's that the realisation – and the disorientating consequences – of that fact kicked in. Then, art became weightless and any sense of forward motion disappeared. Appearing first in Britain but soon spreading to America, Pop Art (sometimes in its early years called Neo-Dada) rudely crashed Abstract Expressionism's party, wilfully flaunting both its claim to authenticity and its insistence on abstraction, emotional intensity, and immanence. Pop took Abstract Expressionism as a model of High Art, Pure Art and Art-for-Itself and opposed it with Dadaistic profanity, irony, ridicule and satire. Revelling in visual cliché, supermarket products, commercial imagery, comics, readymades, collage, quotations and nostalgia, Pop employed techniques adapted from photomontage, film, advertising and mass production, systematically undermining high art with design and commodity trivia. Politically driven, it succeeded in mounting an initially effective attack on a mediagenic world through iconic subversion and ironic commentary. And in the disbelieving hands of Andy Warhol it returned also, in another - and critical - echo of Dada and Duchamp, to a recontextualised self-reflexivity amounting to practical philosophy - although its provocations were now aimed as much at mass media and the marketplace as the art community and its institutions. With multiples and happenings, Brillo boxes and objects trouvees, books of raw transcript and films of raw time, Warhol mercilessly stretched and tested the category of art - again – but this time in the face of its dubious segregation from the rest of the goods in the store. The rebellion of Pop ended when irony and reality became indistinguishable. Warhol's own kamikaze contribution, and what distinguishes him from his contemporaries, had been to show that, freed from the institutions, and even to a certain extent from the artists themselves, Art, with a capital A, was now the exclusive property of the market. And, alongside all the other isms, avant garde TM had also slipped quietly into its place as a wholly owned subsidiary of Art Inc.
'... sounds should be just sounds….in order that each sound may become the Buddha.' John Cage (1959). In all his aleatoric works after Sixteen Dances (1951), John Cage can be located at one extreme of a conversation about communication and reception that proposes to remove intentionality from the production of works. 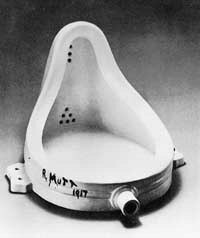 In this, he would share a practice, if not a motive, with Mallarme, with the many Surrealists who experimented with automatic writing and with Marcel Duchamp in his careful non-fashioning of readymades. More than any other composer Cage represents the anti-art aspect of the historic avant gardes, though he couches his own proposition in terms of dissolution through total inclusion. On the other side of this debate, defending the proposition that intention, as the basis of meaningful communication, was a necessary condition of music, we would find just about every other composer before 1950 - all of whom insisted on refining a more or less carefully planned architecture of tones, durations and their combinations in pursuit of order and argument; or emotional expression and sensation – or shaded combinations of the two. Between intention and non-intention, Process Music, Systems Music and Stochastic music emerged, moving the conversation deeper into the implications and possibilities Cage had raised. Agreements, disagreements – always some focal issue, some question or problem intentionally addressed. Two decades later, it was something like this jazz sense of avant garde that was applied to certain strands of rock, initially extending the art claim to elements of an even lower – at that time perhaps the lowest - musical form. However, while avantgarde jazz was pretty clearly defined, what qualified as avant garde rock seemed to be a question less to do with form and more to do with who was using the term, and why. By now, this vagueness of use seemed somehow to be correlated with a similar vagueness in the culture itself.